Edward Bagnall Dimmack was born in Bilston in 1808 the son of Jeremiah Dimmack and Jane Bagnall. Both his parents’ families had been caught up in the heart of the iron, coal and steel revolution that swept this area of the West Midlands from 1750-1800. Jane Bagnall was descended from a junior line of the wealthy Bagnalls of Broseley. The Dimmacks had worked in the Iron founding industry since its inception. Edward was baptised at St Lawrence Darlaston on Christmas Day 1808 together with his cousin Edward Bagnall. He married Anne Thompson in 1831 and had one surviving daughter Frances Anne. She was baptized in a Non Conformist church. Edward Bagnall Dimmack’s father had certainly been involved with the Methodists and Edward would appear to have been strongly independent in his thoughts and conscience. He is quoted in a Report to Parliamentary Commissioners in 1842 on the condition of child labour, with clearly an outspoken view on the need to have the highest ‘moral’ standards of child welfare in the Bilston iron working industry. Edward’s business career seems to have ridden a large boom in the 1830’s and 1840’s that allowed him to gain significant social status in his middle age. His partners and fellow ‘Ironmasters’ appear to have been Thomas Firmstone and John Thompson. The business interests extended to Coal and Iron works in South Wales (Coalbrook Vale Iron Company). Other business with which he was involved in are the Bunkers Hill Colliery and the Parkfield Ironworks in Wolverhampton. 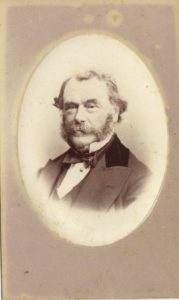 On 1 Feb 1853 he was appointed Deputy Lieutenant for Staffordshire and by 1856 he had become a JP and High Sheriff for the county of Monmouth. In 1852 he was appointed a Director of the South Staffordshire Water Company. He had lived through the devastating cholera outbreaks in Bilston in the 1840’s and the issue of clean water and sanitation was an important social necessity at the time. This brought him into contact with the young Henry Marten, who became his son-in-law and business partner, in the latter part of his career. It is easy to see how these two got on so well – the son without the father, the father without a son – but also independent thinking, keen on modernity and a strong social conscience. By the time he died in 1875 the string of Iron Works, he owned in Staffordshire and South Wales, were in serious trouble as there was enormous consolidation in the industry. The Parkfield Iron Works was wound up after his death. His widow Anne Dimmack continued to live with Henry Marten until her death in 1881.